As I mentioned in my last blog post, I ran away earlier this week with my husband to celebrate our 30th wedding anniversary. We had planned to visit Victoria, British Columbia, but fate conspired to deny my husband the necessary paperwork to cross the border. So I Googled “Romantic getaways near Seattle.” And one of the places that came up was La Conner, specially, the Wild Iris Inn. Now, I was familiar with La Conner as the home, with Mt. Vernon, of the legendary Tulip Festival each spring. But what I didn’t know was that the town is steeped in local history, from the heritage of the Swinomish Tribe across the channel to the early days of Washington State. John Conner (no, not that one—no mention of Sarah) purchased the trading post in 1869 and opened a post office. The town had originally been named Swinomish for the Tribe, but John renamed it to honor his wife, Louisa A. Conner. Many of the homes and businesses in the town still show their frontier roots and are listed on the National Historic Register. Even the toiletries at our inn has an appropriate vintage. In its heyday, La Conner boasted more than 1,000 residents, the first courthouse north of Seattle and exceptionally fine farmland, the produce from which was sent throughout the region and shipped far south. The proximity to a waterway that runs from the San Juan Islands down into more central Puget Sound also made the town an ideal fishing spot. My husband and I noticed a number of crabbers setting out with their pots while we strolled the lovely boardwalk along the waterfront on our trip, with views across the water to Tribal lands. Also prominent is the Rainbow Bridge, which connects La Conner with Fidalgo Island and points west. Beginning in the 1940s, La Conner became known for something else besides abundant crops and scenic waterways: art. That tradition still stands today, with many galleries sprinkled along the boardwalk and throughout the town. La Conner is also home to the Northwest Art Museum and one of the only Quilt Museums on the West Coast. Even the pilings along the waterfront were appropriately artistic. And speaking of art, allow me to share a piece I was given this week: the cover for the Timeless Regency collection Christmas novella. 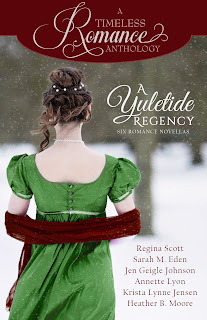 Yuletide Regency is now available for preorder. I’m honored to have one of my Fortune’s Brides stories included. This one tells the story of how Meredith and Julian fell in love, all over a very nostalgic Christmas. Look for more details when the book is released in early November.